Kaparot with chickens and a Shochet will take place this Thursday 7:45pm at the Kosher Co-up Store, 1622 NE 205th Terrace, Miami, FL 33179 (by the warehouses, just west of 95 & Ives Dairy Rd). They're charging $20 with a reservation. Chickens will be available from 5:30 - 10:30 if you are unable to join our group. Can't make it? Reserve and we will do Kaparot for you! Chickens available by reservation only! 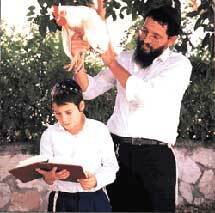 It is customary to perform the kaparot (symbolic "atonement") rite in preparation for Yom Kippur . The rite consists of taking a chicken and gently passing it over one's head three times while reciting the appropriate text. The fowl is then slaughtered in accordance with halachic procedure and its monetary worth given to the poor, or, as is more popular today, the chicken itself is donated to a charitable cause.